If used appropriately, dog diapers are very helpful to owners and pets alike. They can prevent carpet spots, aid in house training and prevent unwanted matings. If used incorrectly, they may cause more problems than they solve. The most important thing to consider about dog diapers is that they are not an alternative to house training. Unless medically indicated, they are for short term use only. Dog diapers are primarily for incontinent dogs. These dogs have a medical condition that makes it impossible to control their bladder. Usual causes for incontinence are advanced age, hormonal imbalance or physical abnormalities. Incontinent dogs benefit greatly from dog diapers because the diapers keep the dog and its bedding clean and dry. 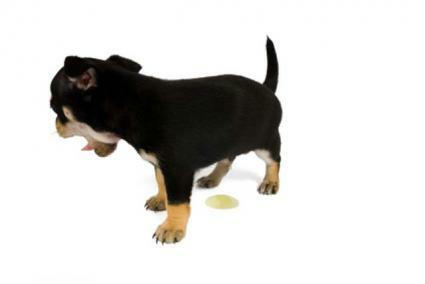 Some incontinent dogs may need to use diapers for the rest of their lives. They are also useful for female dogs in heat. For those females with a heavy menstrual flow, a diaper can keep the house cleaner and prevent constant licking. Many owners use them as a doggie chastity belt since the diaper will also prevent an unwanted pregnancy. Young puppies may need diapers just like their human counterparts. They can be used as an aid to house training, teaching the puppy when and where it is appropriate to eliminate. Is shouldn't be surprising that there are many different types of dog diapers. They vary greatly in design, materials and origin. Full diapers - Resemble those for human babies except there is a hole for the tail. The biggest debate in the diaper world, both canine and human, is cloth versus disposable. There are advantages and disadvantages to both.Cloth diapers can be washed and reused. This saves money and lowers the carbon footprint. They come in a wide variety of patterns and colors for fashion conscious owners. The downside is that it may be unpleasant to wash and reuse the diaper. The initial cost is also higher. Disposable diapers are convenient and easy to discard. The unit cost is smaller, so there is less expense at the beginning. Unfortunately, just as the human version ends up in a landfill, so does the canine diaper. Over the long term, the cost becomes more expensive than cloth. So should you use a canine product or the human one? Diapers made specifically for dogs are usually more expensive than the "people" version. However, they do already come with the important hole for the tail. The canine diaper is also designed for a dog's anatomy. Some breeds are a challenge to fit with human diapers such as Italian Greyhounds which have a large chest and very small waist. The human version is usually less expensive and easily available at grocery stores and discount houses. You can cut the hole for the tail. Be sure that it is in the correct position so as not to discomfort the dog. You may also need to add tape or pins to ensure a proper fit. Most dog diapers are for urine, not feces. If your dog needs that type of protection, read the maker's instructions carefully. You may also want to buy a larger size and add extra padding. Diapers also vary in absorbancy. Make your selection accordingly. Fit is important. Read and follow the instructions for measuring your dog. It is imperative that the diaper be changed frequently. Do not leave a dog in a dirty diaper for hours on end. Besides the obvious discomfort to the dog, it could cause irritation or even infection. Dog diapers are not a substitution for house training. If you are having trouble with training your dog, talk to your vet or a trainer. Canine incontinence can be a symptom of more serious conditions. Don't assume that a diaper is appropriate just because your pet is old. Have your vet check for underlying causes. There may be a treatment to correct the condition. Certain situations make a dog diaper a valuable pet supply. Use it wisely, and you and your pet will be happier.